Maternal Monday II — What Is Your Moment of Obligation? Home / Maternal Monday II — What Is Your Moment of Obligation? Last week, we kicked off our #MaternalMonday Stories campaign, sharing the moments that inspired the Wellbeing Foundation Africa team to dedicate their lives to improving reproductive, maternal, newborn, child and adolescent health. Through our #MaternalMonday online advocacy, we seek to create a tool and platform for health education for every woman and every child. However, we also see the need to get offline and into the homes, classrooms, medical centres, and even Internally Displaced Persons camps, to ensure that a high quality health education can reach everyone, in every community. This is why we began our Maternal Monday antenatal education classes in Nigeria, delivered by qualified midwives. The engaging, culturally sensitive, and highly informative antenatal classes are delivered free-of-charge to both mothers and fathers in various communities across the country. In December 2015, we even delivered this class at an internally displaced persons (IDP) camp in Wassa, Abuja. Read the #MaternalMonday Stories from the #MaternalMonday team below! My moment of obligation came in 2011, when I realized that the excellent work of WBFA needed more visibility in the social media scene. In an increasingly technology driven age, we needed to drive the consciousness of users towards an alignment with health and development priorities. At the Wellbeing Foundation Africa, part of my role is developing ways to leverage the influence of social media as a tool for advocacy, as well as, a tool for health education. This has been made evident through WBFA’s #MaternalMonday campaign on Facebook, Twitter and Instagram. From the inception of this initiative, I have been actively involved in the preparation and dissemination of context-specific and time-relevant information on RMNCAH: the status quo, the challenges, and the way forward. I am happy that I am part of a growing wave of Nigerian men who are engaging with issues around women’s health and issues on female empowerment as demonstrated in the UN Women HeForShe campaign. As a man, I have welcomed the privilege of learning about women’s health, developing messages, and actively participating in health education in order to save the lives of women and children, in line with the United Nations’ Secretary-General’s Every Woman, Every Child initiative. Researching information on women and children has been at the core of my work and I am extremely passionate about their wellbeing. At WBFA, I am able to use my savoir-faire of communications and media not only for the furtherance of education and advocacy, but to easily collect data on the experiences of mothers and healthcare workers, and, by extension, use their testimonies to reduce stigma and provide peer, social and emotional support. My moment of obligation came when I lost a friend and her newborn due to complications in labor. I was distraught but I realized that if this could happen to an educated woman in an urban setting, women in deprived or rural areas would be further disadvantaged in survival during labour. 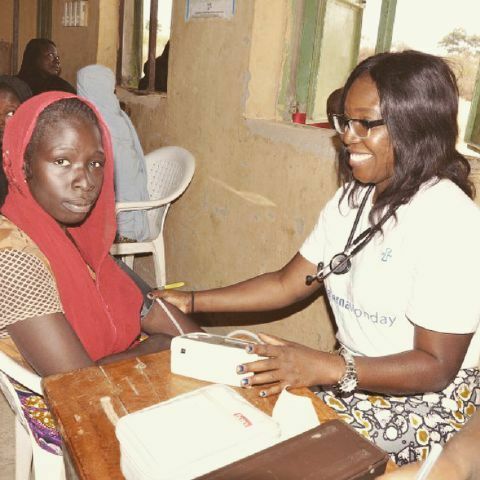 Across Nigeria and sub-Saharan Africa, we continue to lose pregnant women as a result of causes that could be easily avoided by access to primary healthcare, timely referrals for specialist care, and access to WBFA Personal Health Records to track pregnancy progress and patient history. Joining WBFA has given me the opportunity to carve a niche for myself in the advancement in RMNCAH and help prevent the death of women and children like my friend and her baby. Through our numerous advocacy engagements like the renowned #MaternalMonday campaign and implementation of projects like the EmONC training for health workers with Johnson & Johnson and Liverpool School of Tropical Medicine, and the USAID supported Strengthening Advocacy and Civic Engagement project on basic and inclusive education for the girl child, WBFA continues to advance the cause of women and children and empower them in areas that directly and indirectly improve their health and wellbeing. My moment of obligation came in August 2015 when I heard Toyin Saraki speak passionately about the need to empower pregnant women through antenatal health education. As a midwife with a passion to save every mother and child in my care, I did not hesitate to make this vision a reality alongside WBFA and the very same month; I delivered the first antenatal education class at the Medicross Hospitales in Lagos. The excitement of the class was palpable and the success of the first class led to women inviting their pregnant friends to attend further classes, citing that that they had never had health education as informative as the WBFA antenatal education programme. In the classes, we discuss topics such as minor illnesses in pregnancy, nutrition, signs of labour, coping with labour pains, breastfeeding, immunization, and family planning following birth. The class has grown from strength to strength, with further health centres joining our programme in November. In December, we even delivered a class at the Wassa Internally Displaced Persons Camp in Abuja. It was an honour to empower expectant mothers in the IDP camp as they face serious challenges in accessing adequate care and attention. My hopes are that the Maternal Monday Antenatal Education Classes can reach and empower every Nigerian mother with life-saving knowledge. As a midwife, it is my dream - and my obligation - to empower and engage mothers in their health to ensure their survival during pregnancy and childbirth. I began work at WBFA in March 2015 to prepare, organize, and deliver antenatal education classes for expectant mothers in Kwara State. The programme funded by WBFA was created to reduce maternal mortality in rural areas across Kwara. This programme has broadened my own perspective on health education and enabled me to empower so many mothers across Kwara. Indeed, I regularly hear feedback from women saying that they are so grateful to learn more about their bodies and the health of their child at such a pivotal time.